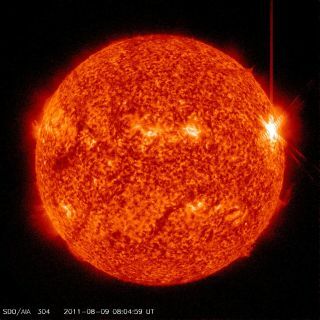 Europe's next two space science missions will investigate solar activity and the nature of the mysterious "dark energy" that is accelerating the universe's expansion, European Space Agency (ESA) officials announced today (Oct. 4). The two missions, called Solar Orbiter and Euclid, are due to launch in 2017 and 2019, respectively. They are medium-class missions, meaning the cost of each is capped at 470 million euros ($625 million). They are the first two missions chosen under ESA's long-term science plan, which is called Cosmic Visions 2015-2025. Solar Orbiter is designed to help scientists better understand the sun and space weather. In particular, it will study the generation and movement of the solar wind, the stream of charged particles flowing from the sun, ESA officials said. Solar Orbiter will come closer to the sun than any previous probe, allowing the spacecraft to sample the solar wind soon after it leaves the sun's surface. At the same time, officials said, Solar Orbiter will also keep an eye on sun storms such as solar flares and coronal mass ejections — huge clouds of solar plasma blasted from the sun's surface — to see how they affect the solar wind. The mission’s launch is planned for 2017 from Cape Canaveral Air Force Station in Florida, aboard a NASA-provided Atlas rocket, officials said. While Solar Orbiter will stare at the sun, Euclid will poke around in the universe's darkest nooks and crannies. The space telescope will map out the large-scale structure of the universe with unprecedented accuracy, officials said. Euclid's observations will cover about 10 billion light-years, revealing key details about the universe's expansion and growth. The universe's expansion continues to accelerate, a surprising find that just today earned its discoverers the Nobel Prize in physics. This acclerating expansion implies the existence of a force counteracting and overwhelming gravity's tendency to bring everything together again. Scientists have named this mysterious force dark energy, and they're still not sure exactly what it is. Euclid could help shed some light on dark energy. It will study the force's effects on the galaxies and galaxy clusters that trace the large-scale structure of the universe, ESA officials said. Euclid will launch on a Soyuz rocket in 2019 from Europe’s Spaceport at Kourou, French Guiana. The selection of Solar Orbiter and Euclid has been several years in the making. A call for missions in line with the priorities of Cosmic Visions 2015-2025 was issued in 2007, and a number of medium-class missions were considered. Solar Orbiter and Euclid were selected from among three finalists. The third finalist, the exoplanet-hunting Plato mission, could still receive consideration for a future flight opportunity, ESA officials said.